7. Urgent Vacancy in Synthesis-R&D / AR&D @ Pharmaffiliates Analytics & Synthetics Pvt. Ltd..
8. Dr.Reddy's - Walk-In Interviews on 31st Mar' 2019 @ Hyderabad..
9. Alembic Pharma - Mega Walk-In Interviews on 30th Mar to 7th Apr' 2019 @ Vapi, Daman, Pune, Nashik & Ahmedabad..
10. MICRO LABS LIMITED - Walk-In Interview for Freshers on 29th Mar' 2019 @ Bangalore..
11. Walk-In Interview for QC, IPQA, QMS, Production & Packing on 31st Mar' 2019 @ Baxter Pharmaceuticals, Vadodara..
12. Life Pharmacy - Walk-In Drive for Pharmacists & Sales Associates on 27th to 30th Mar' 2019 @ Bangalore & Thiruvanathapuram..
13. 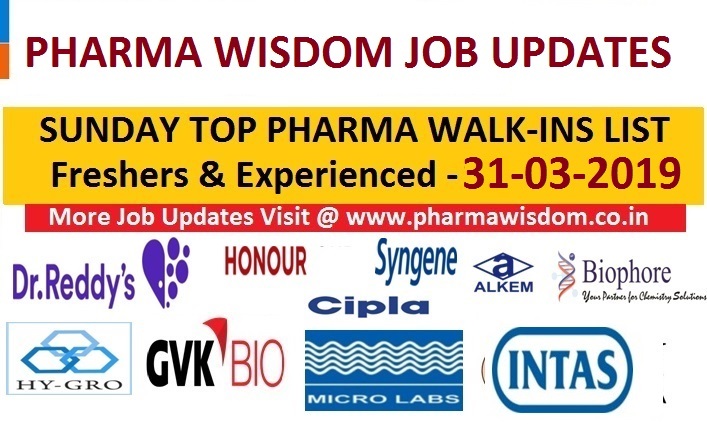 Sri Krishna Pharmaceuticals - Walk-In Interview for Microbiology on 29th Mar' 2019 @ Hyderabad..
14. INTAS PHARMACEUTICALS LTD - Walk-In Interviews for QA / QC / Micro on 30th Mar' 2019..
15. Annora Pharma - Walk-In Interviews for Multiple Positions in QC, QA, Production, Warehouse on 30th Mar' 19..
16. Amoli Organics - Walk-Ins for Freshers & Experienced - Production / Engineering / Maintenance on 31st Mar' 2019..
17. Sequent (Alivira Animal Health Ltd) - Walk-In Interviews for HR & Admin on 29th Mar' 2019..
18. Mylan Laboratories Limited - Walk-In Interviews on 31st Mar' 2019..
19. AUROBINDO PHARMA LTD - Urgent Hiring B.Pharm / M.Pharm Freshers for Internship..
23. Urgent Openings for Freshers & Experienced - Production, QC & Safety Dept. @ Amoli Organics..
24. Agadvi Research Laboratories - Urgent Openings for Research Scientist / Sr. Research Scientist..
25. ALEOR Dermaceuticals Ltd - Walk-In Interviews for Multiple Openings on 31st Mar' 2019 @ Aurangabad..
26. AUROBINDO PHARMA LTD - Walk-In Interviews on 31st Mar' 2019 @ Hyderabad..
27. Vivimed Life Sciences (Strides Company) - Walk-In Interviews on 1st & 2nd Apr' 2019 for Production..
28. Milky Mist - Walk-Ins for Chemist / Production Assistants / Supervisors / Operators / Technicians on 28th Mar' 2019..
29. Walk-In for Freshers & Experienced - R&D / AR&D Dept. on 30th Mar' 19 @ Biophore India Pharmaceuticals, Hyderabad..
30. Bliss GVS Pharma Ltd - Walk-In Interviews for Multiple Positions in QA, QC & Production on 31st Mar' 2019..
31. Aarti Industries Limited - Walk-Ins for Operators / Technicians / Supervisors on 29th Mar' 2019..
32. Walk-In Interviews for Production & QC Departments on 28th Mar to 4th Apr' 19 @ Neuland Labs, Hyderabad..
33. COVALENT LABS - Walk-Ins for Multiple Positions in QC, QA, Production, RA & Solvent Recovery on 30th Mar' 2019 @ Hyderabad..
34. ALMELO PHARMA - Walk-In Interviews for QC & Production on 30th Mar' 2019 @ Hyderabad..
35. Gujarat Fluorochemicals Ltd - Walk-Ins for Chemists, Plant & Utility Operators, Engineers on 30th Mar' 2019..
36. Advantage Healthcare Solution - Campus Drive for B.Pharm, M.Pharm, B.Sc & M.Sc Bio Freshers on 3rd Apr' 2019 @ Pune..
37. Lyrus Life Sciences - Hiring Manager - Formulation Development..
38. Malladi Drugs & Pharmaceuticals Ltd - Walk-In Interviews for Fresh & Experienced Candidates on 30th Mar' 2019..